Pickles is a very good snack. 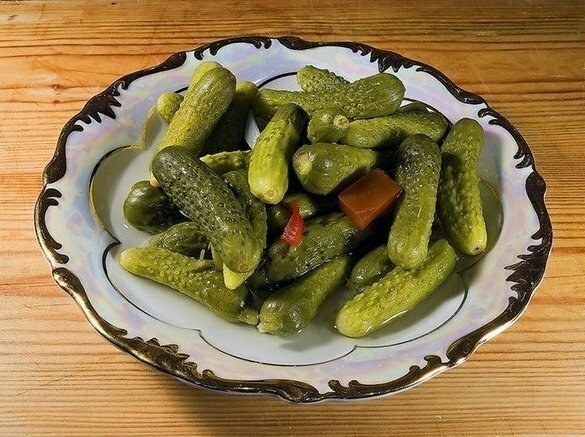 Especially delicious crunchy pickles small – gherkins. And it is not necessary to buy them in the store, it's so easy to roll up a few jars for winter at home. - 100 ml of 9% vinegar. For marinating pick smooth small cucumbers, no longer than 5-6 cm Wash them and cover with cold water for 2-3 hours. This is to ensure that after sterilization cucumbers had shriveled and stayed crispy. Meanwhile, prepare the banks. Marinate cucumbers in one-litre jars in half-liter and 700-gram under the tin lid, which roll machine, or under a screw. The latter is preferable, as it simplifies the process. Wash jars, sterilize over steam, or pour boiling water for 10-15 minutes. The cover should be free of rust and other damage. Wash them and boil for 15 minutes. Clean, sterilized jars and lids put on the ironed napkin or towel and enjoy a cucumber. At the bottom of the jars, put chopped 2 pieces garlic, chopped horseradish leaf, whole leaves of cherry and currants, dill. Remove the cucumbers from the water, rinse under the faucet and tightly put in jars. Put on the fire two pans. One with clean water, and secondly make the brine. To 1 liter of water, add 100 ml vinegar, 2 tablespoons of salt and 3 tablespoons sugar. Bring to a boil. Conventional banks pour boiling water and cover with lids, not roll. After 10 minutes drain the water and again cover with boiling water. The third time, pour the brine, pre-sprinkling of mustard seeds and put the pepper. Roll up, turn upside down and wrap something warm. After a few hours, the cucumbers can be removed and put in storage. You don't throw cucumbers at once, and to sterilize water. It does not need to fill them with boiling water, and immediately pour the cooled brine. Place the jar in a large pot with water, which should cover their shoulders. Cover caps, roll up your. Turn on the fire. When the water boils, note the time. For litre cans required sterilization for 40 minutes, for a half-liter – 20 minutes. Then roll up, turn upside down and leave to cool. Wrap is not necessary, otherwise the cucumbers will become soft. To know for sure how much brine you need for a particular jars filled with cucumbers, fill it with water, and then drain into the pan. This will be the amount that you wanted to find out. Only add 100-150 ml per evaporation, before brine is boiled.